Happy New Year everyone! I'm really looking forward to '10, it's going to be a great year for animation I think. 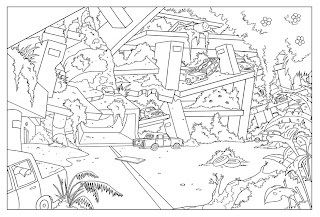 Here's a few more layouts/bg designs from the show I'm currently working on called "Wild Grinders". Whoa, it looks like pictures of Haiti at the moment. Yikes, how uncanny sometimes we draw things that end up showing up in real life. For Lilo & Stitch, I worked on the scene where Stitch hijacks a plane and flies it through downtown Honolulu. That scene was cut from the final film, instead Stitch steals the alien space craft and flies it through the Hawaiian mountains. See you soon! The back is slowly healing, and I'll be sending out SC invites again. Wow yeah, I didn't even think about that, but very true. I remember you told about the Lilo $ Stitch scene and have seen some of the drawings where it's a plane instead of a space ship. With drawing comes great responsibility I guess:O.
Glad to hear your back is getting better:). @Andrew: Thanks and right back at ya. Happy New Year! Super! You definitely capture the chaotic and dramatic feel!! Looks like a post apocalyptic scenario. And for the record, I am NOT cleaning that up. Good stuff, can't wait to see the finished project. Wow! The senseless details artists are forced to draw these days!! My goodness! Lol Ree....I can't help it! Captain Vidic will miss home encounters with Tottenham and Arsenal as he nurses a calf injury.Kirk Sanford Sightline Payments Yet Smalling and Jonny Evans have already proved themselves to be able deputies when required and United also have the highly-rated Phil Jones sbobet in their ranks following his summer arrival from Blackburn.